The Khumbu Icefall is an icefall situated at the leader of the Khumbu Glacier and the foot of the Western Cwm, which lies at an elevation of 5,486 meters (17,999 ft) on the Nepali inclines of Mount Everest, not far above Base Camp and southwest of the summit. The icefall is viewed as a standout amongst the most unsafe phases of the South Col course to Everest's summit. The Khumbu ice sheet that structures the icefall moves at such speed that extensive precipices open with small cautioning, and the vast towers of ice (called seracs) found at the icefall have been known not all of a sudden. Colossal pieces of ice tumble down the icy mass every now and then, their size running from that of autos to vast houses. It is evaluated that the ice sheet progresses 0.9 to 1.2 m (3 to 4 ft) down the mountain consistently. Most climbers attempt to cross the icefall amid the early morning, before dawn, when it has halfway solidified amid the night and is less helpless to development. As the extreme daylight warms the region, the erosion between the ice structure decreases and expands the odds of chasms opening or squares falling. The most perilous time to cross the Khumbu Icefall is by and large mid-to late-evening. Solid, acclimatized climbers can raise the icefall in a couple of hours, while climbers experiencing it surprisingly, or lacking acclimatization or experience, and tend to make the voyage in 10–12 hours. "Camp I" on Everest's South Col course is regularly somewhat past the highest point of the Khumbu Icefall. Once in a while, a climber will encounter an extensive square of ice slamming down in their region. The subsequent impact of uprooted air and snow can bring about a "cleaning" (the saving of a surging billow of light ice and snow on the climber). To those that have encountered it, it is an exceptionally alarming knowledge. 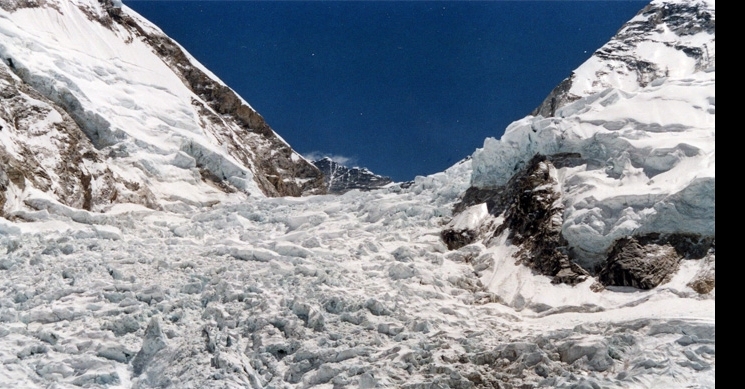 In the event that a climber is gotten in a torrential slide or other "development" occasion in the icefall, there is next to no they can do with the exception of plan for potential entanglement by substantial pieces of ice or prompt development a short time later, to attempt to save others. It is essentially difficult to flee or even to know which approach to run. A few individuals who have kicked the bucket in the icefall and whose bodies have not been recuperated have supposedly appeared at the base of the icefall numerous years after the fact, as the ice consistently moves descending toward Everest Base Camp. Those bodies have been recuperated and given appropriate internments. Following the structures are constantly changing, crossing the Khumbu Icefall is greatly perilous. Indeed, even broad rope and stepping stool intersections can't avoid death toll. Numerous individuals have passed on here, for example, a climber who was squashed by a 12-story square of strong ice. Uncovered precipices might be anything but difficult to maintain a strategic distance from, yet some might be covered up under risky snow spans, through which unwary climbers can fall.